The south coast of Cornwall, England is lighting up cinema screens as the starring location in Richard Curtis's new film, About Time. The latest film from the man behind Notting Hill and Love Actually follows the story of Tim who at the age of 21 discovers that he can travel in time. When his father tells him that the men in his family have the ability to travel through time Tim sets out to make the world a better place... by getting a girlfriend. Of course, as with all good Rom-coms, this isn't as easy as he first thought. The film follows Tim (Domhnall Gleeson) from the Cornwall coast to London where he trains as a lawyer, he then meets the beautiful but insecure Mary (Rachel McAdams). They fall in love, he travels through time, things happen, he tries to change them and finally after a lot of events he wins her heart. Along the way he uses his powers to create the perfect proposal, a great wedding speech and he also manages to save his best friend from disaster. Tim also finds out that while creating his perfect life his power cannot save him from the sorrows that affect all families, everywhere. About Time is a comedy about 'love and time-travel which discovers that, in the end, making the most of life may not need time-travel at all'. The feel-good rom-com was part filmed in the St Austell Bay area of Cornwall during 2012. 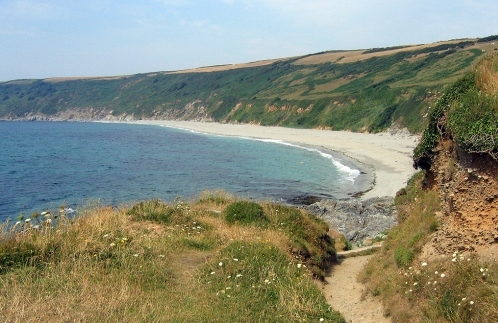 The secluded Vault beach near Gorran Haven features in the film, while the St Austell Rugby Club was converted into a pop-up Hollywood production office. Tim's family home is an impressive private Cornish residence which serves as a central location for the plot and also serves an anchor as the lead character moves between Cornwall and London. 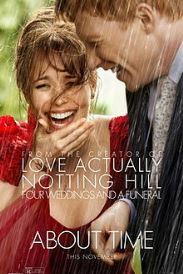 About Time is the latest in a long line of film productions to choose Cornwall as a filming location. 'Summer in February', starring Downton Abbey's Dan Stevens, and Brad Pitt's 'World War Z' recently featured scenes filmed in Cornwall. Richard Curtis spent time in Cornwall researching locations before filming began on his new movie. He even cast a Cornish local, Rebecca Chew, who was working at a seaside cafe in Polkerris, Cornwall, after she served pizza to Curtis and his family. He was so impressed with her that he later contacted her to cast her as a waitress in the film. She can now be seen in the film serving Domhnall Gleeson in a scene. The official song for the film, 'How Long Will I Love You' by Ellie Goulding also feature images of Cornish beaches, further reflecting the beautiful locations that star in 'About Time'. Tourist Boards have long realised the importance of welcoming movie productions to their shores. With a blend of Hollywood Royalty, a beautiful love story and stunning locations, TLTB can't wait to watch in the cinemas with a box of popcorn for a teary, lovely Rom Com.